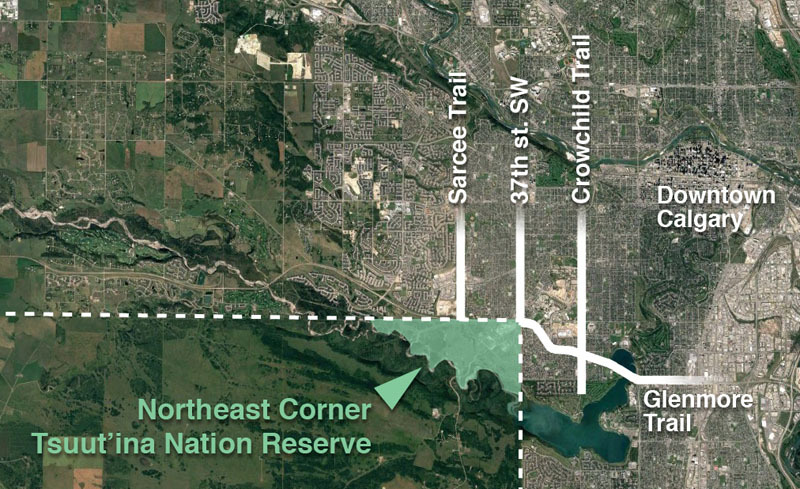 Why was the SW ring road planned through a First Nation’s reserve? How did the Weaselhead come to be owned by the City of Calgary? Why are Unexploded Ordnance being found in the Elbow river valley? Join me again on this year’s Jane’s Walk through a beautiful and historic part of Calgary. This is the fifth year that I will be leading the walk, and it will be a chance to talk about many of the issues I have covred on this blog; to look at the history of the SW Ring Road and to explore the past, present, and future of the Weaselhead area, one of the most historically rich parts of Calgary. We’ll travel along the first Provincial highway that was built through the Tsuut’ina Nation reserve over 115 years ago (with origins dating back even before the signing of Treaty 7) and through land that was purchased in the 1930s for the Glenmore Reservoir. We’ll see where the Canadian Military operated the largest WWI training camp in Western Canada, and explore the legacy of disputed land ownership and unexploded ordnance that years of military use has left behind. We’ll experience one of the quietest corners of the city, now adjacent to where the SW Ring Road is being built, and see where previous plans would have located the road through the valley. We’ll look at the role that the Tsuut’ina Nation’s economic development plans have played in getting the road approved, and how Calgary and the Nation can come together as development progresses. Thank you to Stephanie Hawes for providing the photos of the 2017 walk! Although construction of the Southwest Calgary Ring Road has been ongoing for the past few years by the KGL Constructors partnership, it is not always easy to see what progress is being made. A large portion of the road is located on former Tsuut’ina Nation reserve land which isn’t accessible or visible to the average Calgarian, and as such, getting a sense of the work being done on this project can sometimes be difficult. Last fall, Reddit user ‘Craftyshrew’ flew over Southwest Calgary and captured an image of the ring road project from the air. The cleared land along the route carves a visible corridor through the former reserve land, where the scale of the project, and the progress of construction, can be seen. At this stage in the project, construction has begun to some degree on all 14 of the interchanges along the Southwest Calgary Ring Road route, and grading for the mainline ring road lanes is approximately 45% completed. Bridge pilings have been started on many of the interchanges, with the rest commencing as the 2019 construction season begins. Construction of all interchanges will continue into 2020, when the majority of the paving will be undertaken. The southwest portion of the ring road is scheduled to be open to the public in the fall of 2021. Thank you to Craftyshrew on reddit for their kind permission to publish their photo, and to Adam Johnson and Rizwan Hussain from Alberta Transportation. Join me on this year’s Jane’s Walk through a beautiful and historic part of Calgary. This is the fourth year that I will be leading the walk, and it will be a chance to talk about everything I cover on this blog; to look at the history of the SW Ring Road and to explore the past, present, and future of the Weaselhead area, one of the most historically rich parts of Calgary. Thank you to Stephanie Hawes for providing the photos of last year’s walk! I have recently had the opportunity to work with the Tsuut’ina Nation-Canderel Development Partnership on some design and communications work, including the website for their upcoming Taza development. I’m pleased to see the launch of the ExperienceTaza.com website this week, which provides information on this transformative First Nations project, located right on the edge of Calgary. Taza is a series of three commercial development areas, or ‘villages’, that are located on the eastern edge of the Tsuut’ina Nation reserve. From north to south, Taza Park, Taza Crossing and Taza Exchange are connected along a 9km portion of Calgary’s Southwest Ring Road, known as Tsuut’ina Trail where it crosses the reserve. The name ‘Taza’ is a Tsuut’ina word for an expression of amazement, and the development has adopted the tagline ‘Together at Tsuut’ina’. The Taza development is a joint-venture between the Tsuut’ina Nation and the development company Canderel, and represents the culmination of nearly 50 years of economic development and planning by the Nation. For the story on the early years of the Nation’s economic planning, click here. Click on the maps in the following sections for a larger version of each. Taza Park is a 530-acre parcel of land located on Glenmore Trail that was previously home to the Harvey Barracks Military base. The ring road bisects Taza Park into two parcels, and the development area extends from the community of Lakeview on the east to Discovery Ridge on the west. 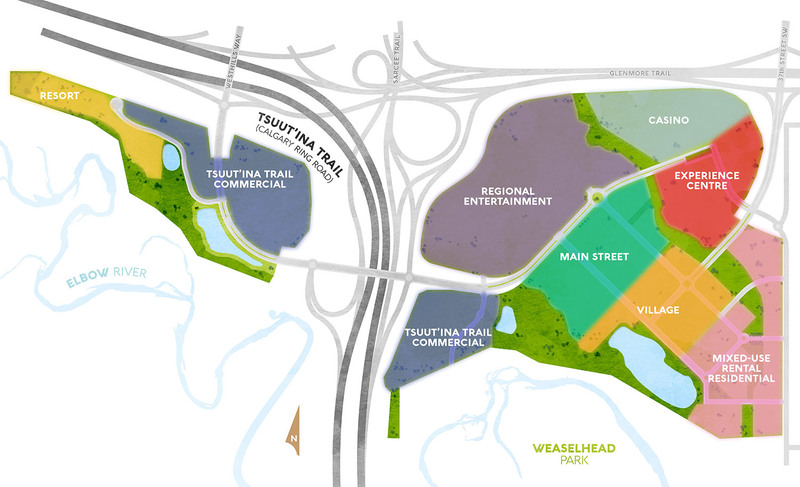 Access to the site is provided by three primary interchanges at 37th street SW and Glenmore Trail, at Tsuut’ina Parkway at Tsuut’ina Trail and at the new Westhills Way. Secondary access is also planned at several existing roads along 37th street SW that were originally built to provide access to the former military base. The area is touted as a “dynamic recreation and entertainment destination” and consists of a mix of retail, dining, residential, recreational and cultural amenities. Taza Park interfaces with the existing community of Lakeview with a new lower-density residential area on the west side of 37 street SW.
What follows is a short historical overview of the history and use of 37 Street SW in the community of Lakeview in Calgary. The road has a surprisingly long and interesting history, with a long tradition of First Nations, Military and Community use of the corridor since it was first set aside as a road. In 1883 the Tsuut’ina Nation reserve was first surveyed and reserved for the Nation, shown below. The same year the adjacent township was surveyed, dividing up what is now SW Calgary. This survey laid out the 66-foot-wide 37 Street SW road allowance for the first time. The arrow on the survey below indicates the road. When the reserve was first created, the Tsuut’ina Nation established a trail through the reserve to access Calgary at what is now 37 Street SW and Glenmore Trail. This route was part of a trail known as the Priddis Trail. The map below from 1897 shows this trail. In 1900 the government formalized that trail into a highway through the reserve, and moved the reserve entrance to what is now the Weaselhead parking lot at 37 Street SW and 66 Avenue SW. Accessing the reserve meant traversing one mile of 37 Street. Below is a map from 1926 showing route of the Priddis Trail. For a brief time in 1930 the Priddis Trail, including that portion of 37 Street SW, was earmarked as the route of Highway 22, before ultimately being built from Midnapore. The Priddis Trail served the Nation and Calgarians for 58 years, until the bridge over the Elbow collapsed in 1958 (pictured below). Nation citizens had already been using the Military’s new bridge, which was constructed around 1950 over the Elbow river, and returned to using the old reserve entrance point at the intersection of Glenmore Trail and 37 Street SW. The Military built several more roads in 1957-58 that connected to 37 Street SW to allow access to Military housing and a school on the west side of the road. At this point in time, access to the Military base, the Tsuut’ina Nation reserve and a cattle ranch are the primary uses of 37 Street SW, and construction of Lakeview had not yet been started. The map shown below is from 1960. When planning for the new community of Lakeview began in 1959, the City of Calgary designated 37 Street SW as a ‘Major Thoroughfare’ and added 34 feet to the width of the road’s original corridor. In 1960, construction began on the neighbourhood. The first houses were built on the east side of the community, near Crowchild Trail. Over the next decade construction moved west, closer to the newly-paved 37 Street SW, and the final phase of Lakeview’s original single-family homes were built in 1968-69. Below is a picture of Lakeview from the 1970s, looking west along 66th Avenue SW. In 1970, after much of Lakeview is largely completed, traffic maps for the first time show traffic on 37 Street SW. About 5,000 cars per day are shown on the road near Glenmore Trail, with the numbers dwindling lower towards the south end of the road. The change of the road from rural right-of-way into suburban thoroughfare marks the most significant change in the use of 37 St SW in the history of the road. Traffic on 37 Street SW was at its peak in the 1970s, when Military use, Lakeview access, and users of North Glenmore Park constituted the majority of traffic. In the 1990s the Military base was closed, and traffic has declined overall since that time. The City of Calgary’s traffic map from 1970 is shown below. In 1967 the City of Calgary had already planned for the 37 Street SW – Glenmore trail interchange to be a ‘diamond’ style interchange when conditions warranted it. The plan from the City of Calgary’s 1967 CALTS report is shown below. In 2010 a new temporary interchange was built at 37 Street SW and Glenmore Trail. The interchange was designed so that the bridge over Glenmore Trail was located away from where a permanent interchange would eventually be built. This would allow the interchange to remain open while a new interchange was being constructed. The current interchange is shown below, looking towards the Southwest. In 2013 the Province of Alberta and the Tsuut’ina Nation entered into an agreement to sell land for the Southwest Calgary Ring Road. This agreement guaranteed access to the Tsuut’ina Nation reserve at 37 Street SW and Glenmore Trail as part of the ring road project. If this access is not provided, the ownership of the entire ring road corridor through the reserve will revert back to the Nation. The design of the new permanent interchange is shown below. The contract for construction of the ring road project including the new interchange at 37 Street SW and Glenmore Trail was awarded in 2016, and some initial earthworks has already begun. The interchange is set to open by 2021. Next year, a new development located on the Tsuut’ina Nation reserve is set to be officially unveiled. 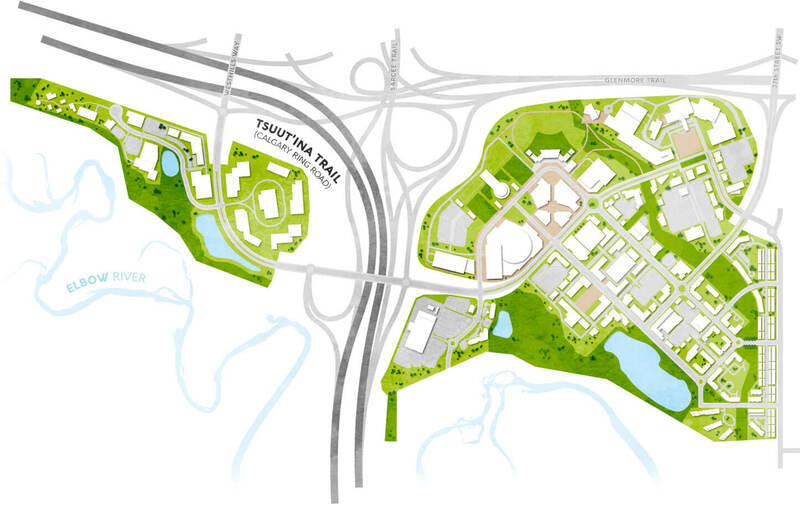 The project, the result of a partnership between the Tsuut’ina Nation and the developer Canderel, is located along a 10km portion of the Southwest Calgary Ring Road, and is being touted as a transformative combination of retail, commercial, entertainment, health, residential and tourism amenities on Calgary’s doorstep. District map of a development area on the Tsuut’ina reserve near Glenmore Trail, part of the Taza development. Image courtesy of the Tsuut’ina – Canderel Land Development Partnership. Given that the development relies on access from the ring road, known as Tsuut’ina Trail as it crosses the reserve, it would be easy to see the project as a direct result of the construction of this road. However, it’s more accurate to say that the construction of the road is a direct result of the Nation’s desire to develop reserve land on Calgary’s border. Although the proposed development is certainly a new undertaking for the Nation, the idea of developing land on the reserve’s eastern edge is one that’s been nearly 50 years in the making. The planning for both the road and the developments were initially done independently of each other, with each involved party willing, or even preferring, to proceed without the other. As time went on it became increasingly clear that neither could be completed without the other, and the two projects eventually became inseparable. The Nation has derived economic benefit from reserve land in different ways over the years, including royalties from oil and gas extraction, land leases, and the sale of surface resources such as timber and gravel. Though important, these sources of income alone have not always provided the growing community with the resources it needed to be prosperous. In the early 1970s the Tsuut’ina Nation sought to create more ambitious economic enterprises, and looked to take advantage of the proximity of the City of Calgary to help make that happen. In recent years those plans have revolved around the Southwest Calgary Ring Road, though this was not always the case. In 1970, Tsuut’ina citizens Reg One Spot and Arnold Crowchild were appointed to head up a newly-formed economic committee by the Nation’s Chief and Council.1 The committee’s mandate was to explore development opportunities on reserve lands, and to assess the benefits and drawbacks of any such initiatives. Photo of Reg One Spot and Arnold Crowchild. Michael Burn. Calgary Herald. October 17, 1970. The east side of the Nation’s reserve, being directly adjacent to Calgary, was seen as an ideal place to explore development opportunities. This portion of the reserve benefits from its close proximity to the city, including access to potential customers and the City’s transportation network, and was viewed as some of the most viable land for commercial development. The relationship between the Nation and local city residents was noted as an important consideration for any potential development, and this relationship was to be maintained by sensitive developments. “[Our developments] would have to be clean industries so we won’t develop bad relations with our City neighbours close-by” said Mr. Crowchild and Mr. One Spot5, a position which would be reiterated by a soon-to-be-released consultant’s report. 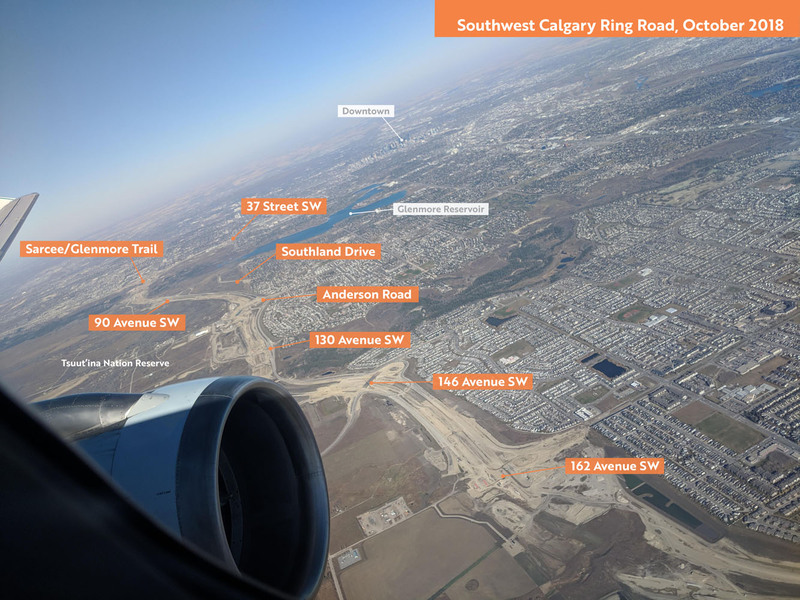 Building the Southwest Calgary Ring Road project is a massive enterprise, and includes the construction of hundreds of kilometre-lanes of roads, 49 bridges and 14 interchanges, but the project involves more than just a freeway. One of the first projects to be undertaken in preparation for the construction of the ring road involves the relocation of an electrical transmission line; one that not only crosses the ring road corridor, but also bisects the Northeast corner of the Tsuut’ina Nation reserve. A satellite image showing the location of the northeast corner of the Tsuut’ina Nation reserve in relation to southwest Calgary. Source: Google Earth. AltaLink, the company that owns the bulk of Alberta’s electrical transmission network, is currently in the process of installing a new underground transmission line within the right-of-ways for Glenmore Trail and 37th street SW. This work is being done in advance of the decommissioning and salvage of the portion of the existing line that crosses the reserve, and the story of how the existing line ended up on reserve land, and why it is now being removed, is an interesting one that dates back almost 100 years. In 1924 the Calgary Power Company Ltd. planned an electric transmission line to connect their hydroelectric operations at horseshoe falls on the Bow river to south Calgary. Transmission Line No. 3 was to split off from an existing line at Jumping Pound, then head south and east for 35 kilometres to Macleod Trail at 50th avenue SW.1 Despite a few alterations over the years, this route remains largely intact and in service today. Map showing the full extend of Transmission Line No. 3, from Jumping Pound to the intersection of 50th Avenue SW and Macleod Trail. Source: Google Earth, ‘Plan showing land required for right-of-way of Transmission Line No. 3 from Jumping Pound to Calgary through Townships 23 & 24 in Ranges 1, 2, 3 & 4 all west of the fifth meridian and through the Sarcee Indian Reserve’ R.V. Heathcott. Calgary Power Company Ltd. Alberta Land Registry Plan RW176. 1924. Survey showing the route of Transmission Line No. 3 as it crosses the Tsuut’ina Nation reserve. Source: ‘Plan showing land required for right of way of Transmission Line No. 3 in the Sarcee Indian Reserve through Tp.23 Rg.2 W5th Mer.’ R.V. Heathcott. Calgary Power Company Ltd. Canada Lands Survey Plan IRR 2059. 1924. At the time of the survey, this part of the Tsuut’ina reserve was under lease to the Department of National Defence. Known as Sarcee Camp, the land had been turned into a training camp in 1915 in the midst of the First World War. When permission to cross this land was sought by the Calgary Power Company, the request was handled by the department of Indian Affairs, and no record of the involvement or approval of the members of the Tsuut’ina Nation are on file with the Federal Government. With the survey in place and permissions acquired from other landowners along the entire route, the line was soon under construction. In 1926 the line was energized, and began to serve the increasing electricity needs of a growing modern city. Throughout the late 1920s and 1930s Transmission Line No. 3 operated unobtrusively side-by-side with Sarcee Camp. The camp was in regular use for peace-time training, but the outbreak of another war would change much on the Tsuut’ina reserve, including the transmission line. In 1939 Canada became embroiled in World War 2, and military installations across Canada, including Sarcee Camp and the newer Currie Barracks to the north, were seeing increased use. Photo of the runways at Currie Field, with the Glenmore reservoir in the background. Source: Richard Brown. Bomber Command Museum of Canada. As part of the war effort, the Canadian Government earmarked Calgary as the site of a new air school. Service Flying Training School No. 3 was to be established on land directly northeast of Sarcee Camp as part of the British Commonwealth Air Training Plan,5 a scheme that would see tens of thousands of airmen trained across Canada and the world during the war. 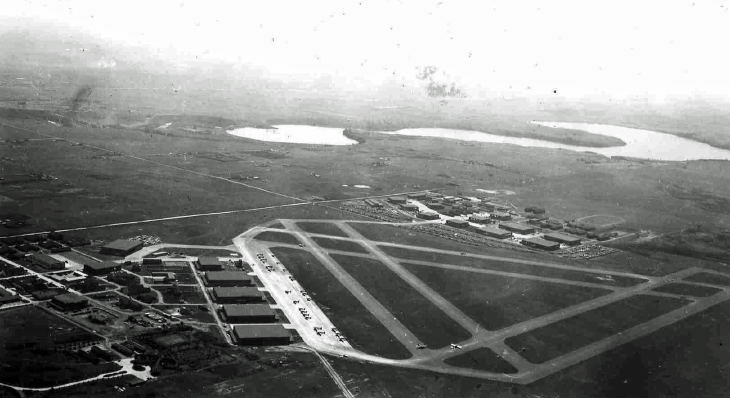 The land selected for the new air school had already seen use as an airfield for a number of years as Currie Airfield, but formal runways hadn’t been constructed up to that point. Transmission Line No. 3 crossed directly through the chosen location for the new triangular runway of the flight school, and this overlap meant that the power lines had to move. A slight relocation of the line would not suffice as the raised power lines posed a threat to taking-off and landing aircraft,6 so a more significant move was required. 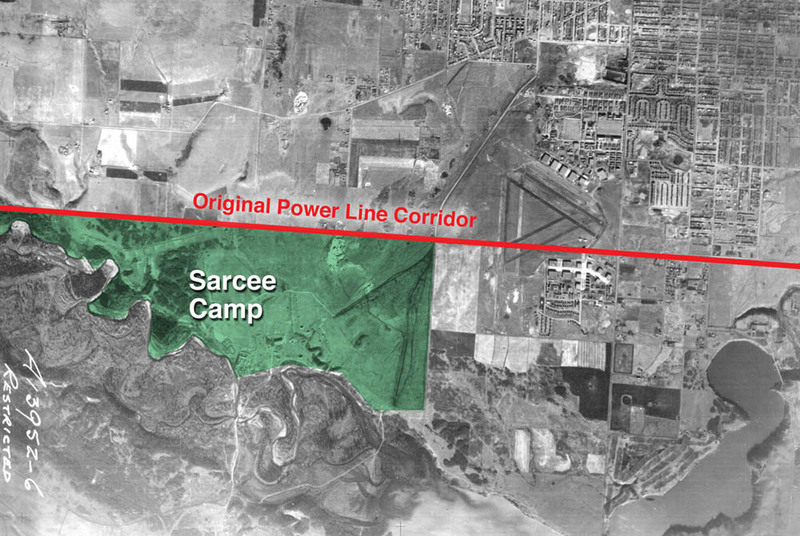 Aerial photo showing the location of Sarcee Camp, and of the Transmission Line No. 3 corridor that ran along the 50th avenue SW road allowance. Source: Photo A13952-6, University of Calgary Alberta Air Photo Collection. National Airphoto Library. 1955. There is no record of any approval of the relocation by Tsuut’ina Nation members, nor of the Nation being notified of the potential move. Since the Department’s approval was granted less than a week after receiving the request, there would have been insufficient time for a formal surrender to have been granted by the Nation. As this was a case of one Federal department communicating directly with another, it appears unlikely that the request ever left Ottawa. 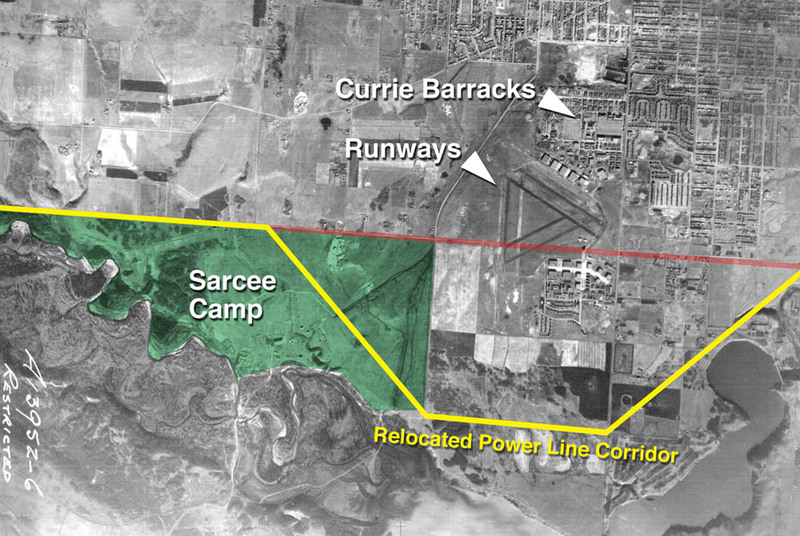 Aerial photo showing the position of the relocated transmission line across Sarcee Camp, and the relative location of the Currie Barracks and the air school runways. Source: Photo A13952-6, University of Calgary Alberta Air Photo Collection. National Airphoto Library. 1955. Article announcing the opening of the Service Flying Training School No. 3. Calgary Herald, October 28 1940. Welcome to my Southwest Calgary Ring Road site. It serves as a resource for historical and contemporary information regarding this road, and the issues that surround it. Check out the Timeline (in the menu at the top of the page) for a good place to start, look at the list below to see all of the articles, and click on links within the articles to see more on any topic. If you only read one article on the ring road, Make it this one! Subscribe using the link below to be notified of any new posts, and if you have any questions that are not answered on the site, get in touch!